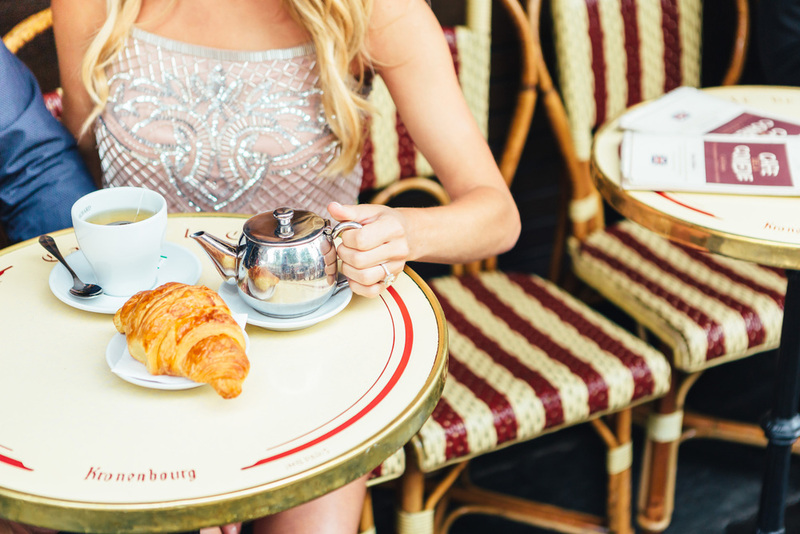 We obviously had to begin our shoot at Trocadero with the iconic view of the Eiffel Tower as the backdrop. There is something very special about the warmth of the sun as it rises in Paris. It is gold and gentle as it blankets the city in pastel tones, so of course we chose sunrise for the start of the session. This is also a great idea, since during the early hours of morning the city streets are empty, which adds this extra special look for the photos. While at Trocadero, Paige quickly changed into her second gown and we headed down to the Louvre for the next part of the shoot. The Louvre Museum is one of our favorite locations to photograph as between the modern glass Pyramid, the exquisite facades, the beautiful courtyards, there are so many options to capture that special Parisian image. 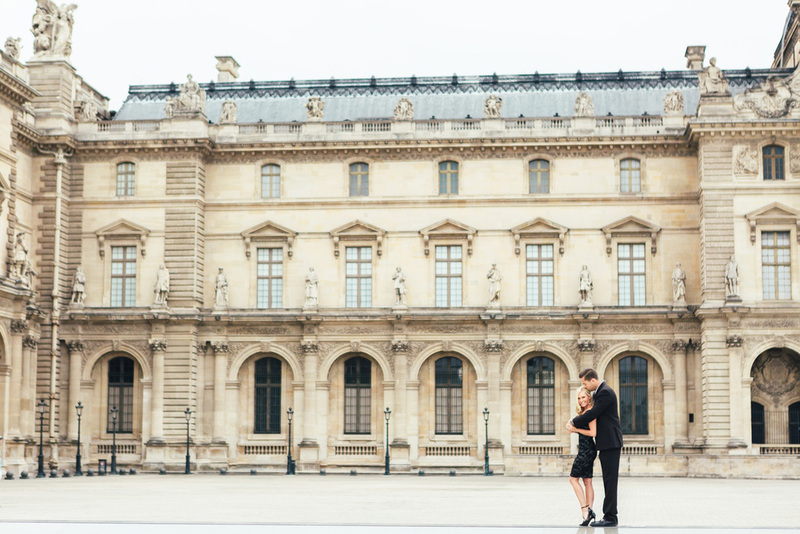 An engagement session in Paris should always have a stop at a café, and one of our favorites is Café de la Comedie right next to the Louvre by Palais Royal. 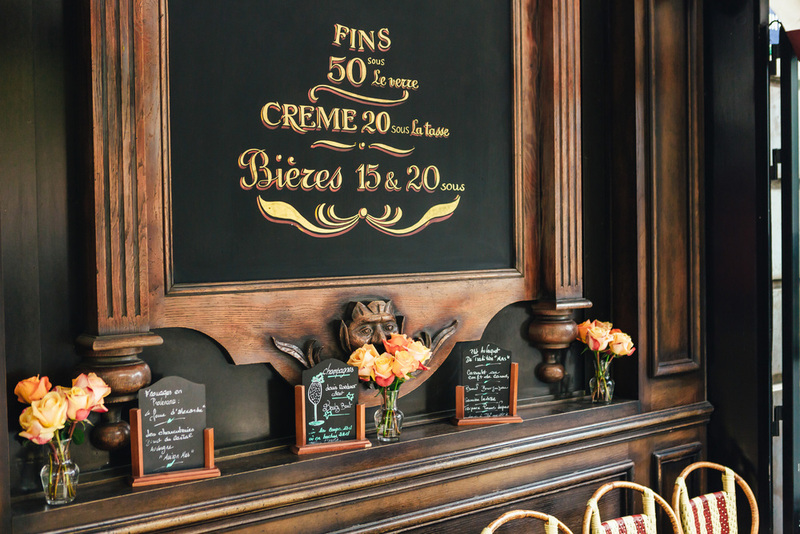 Wood panel exterior, small chalkboards with the day’s menu on the wall sitting next to roses, that’s the usual scenery the Café greets you with. A cafe stop is also a great opportunity to change up the outfit again, so Paige switched into her third gown. 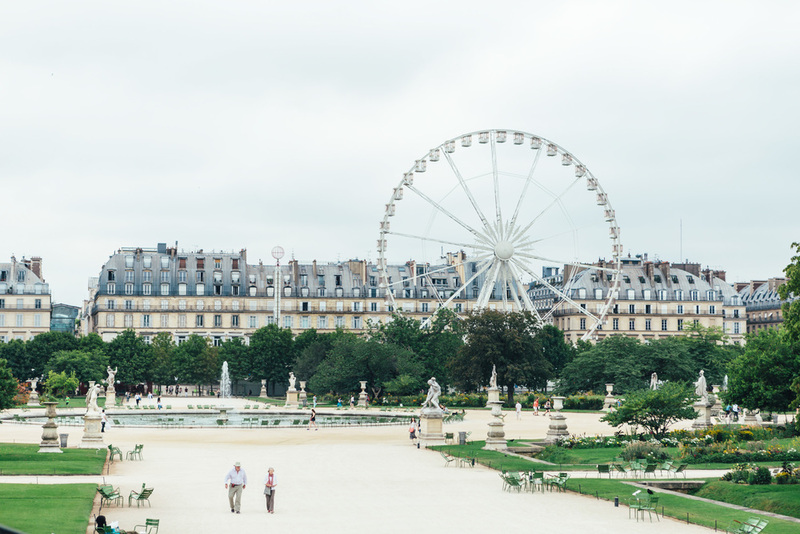 Two croissants, a cup of tea, and a little waltz later (given that Paige and Matt are great dancers they showed us a thing or two about the perfect waltz in the outside hallways of the Louvre), we pushed on with a stroll through Tuileries until arriving at Alexander III. Although taking professional photos is forbidden in Tuileries garden (something to keep in mind when planning your perfect shoot), there is a side alley where the security is scarce and the view of the Louvre in the background is beautiful, and a quick stroll away we come to Alexander III bridge. It may be the prettiest bridge in the city and it also offers a slightly different angle to see the Eiffel Tower in the background. Please don’t hesitate to reach out to us to plan and capture your own perfect photoshoot in Paris.